Prepare and present financial reports on a monthly basis. Prepare and present quarterly reports and forecasts with detailed analysis of short/long term trends and implications for the business of the firm. Prepare, present and submit year-end statements to the government and liaise with external auditors during the year-end audit process. Provide input and advise on matters pertaining to risk and legal ramifications of business/accounting efforts, and liaise with external legal counsel as/when required. Provide input and advise on all matters affecting profitability. Provide input and advise on all interpretations of impacts of decisions related to corporate budgeting, financial planning and short/long term revenue forecasting. Support Management in their preparation of annual capital and operating budgets. Review all transactions in the general ledger on a monthly basis. Manage the internal Accounting Team that will report directly to the Controller. This internal team is responsible for payroll, bank reconciliations, accounts payable/receivable, budget variances, standard contracts, insurance, inventory control, government remittances etc. Manage the internal ERP (Ajera/Deltek) Technical Support Team. Perform other related “as-and-when” required tasks and requests made by Management through the President that may include items related to Information Technology (IT) and/or Human Resources (HR), if necessary and appropriate. CPA (CGA, CMA or CA) with a minimum of 4 years working experience, preferably in a small and dynamic consulting firm environment. Appropriate education (university degree preferred) in accounting, finance, or business studies. Understanding of ERP applications and the audit trail. Specific knowledge of Ajera/Deltek ERP products would be favourable, but not essential. An entrepreneurial mindset and a willingness/ability to seek to optimize the overall efficiency of the corporation. Willingness and ability to grow the role and responsibilities as the needs of the firm evolve over time. Bunt & Associates offers competitive salaries, performance bonus incentive programs, ownership opportunities, and a competitive benefits package. Salary compensation offered will be commensurate with experience and skills. 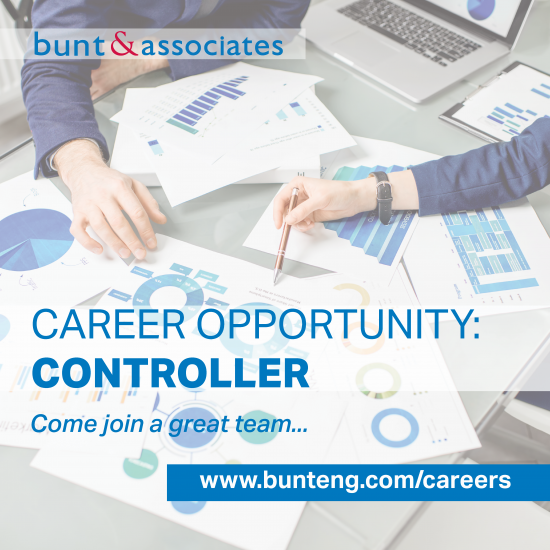 If you feel that you possess the necessary experience and skill set, please email your resume, references, and cover letter to info@bunteng.com. We thank all who apply, though only those applicants to be interviewed will receive a response.